You may not know this, but I love soccer. Not like love it, but I love it like I love competitive swimming. I can do it, I like to watch it, but honestly I'm terrible at it. I played soccer for years as a youth, and even picked up with an indoor league post-college. It's fast, exciting and 80 percent of the people who play it are good-looking, amiright? Anyway, the World Cup starts today, beginning a marathon of television coverage, international rivalries and—if you're like me—an inspiring reason to go out scoping for dudes at sports bars. I don't think I should really have to explain my thinking on this one, but I will anyway: Because soccer is such an international sport, its fans are naturally (at least slightly) worldly and cultured. This being the World Cup, and this being New York City, the odds of meeting beautiful men people from around the globe who have migrated here and want a taste of home in the form of their favorite sporting pastime are high. If you're a little exhausted of the usual dating pool and Tinder makes you want to throw your phone off the Brooklyn Bridge—is this not just the thing to spark some potential romance with a side of foreign accent? Thanks to handy maps from The New York Times and The Huffington Post, we can drop into bars all over the city that cater to specific countries. And on that note, what team to support? If Textile Elizabeth and James has any say, perhaps quite a few of them. 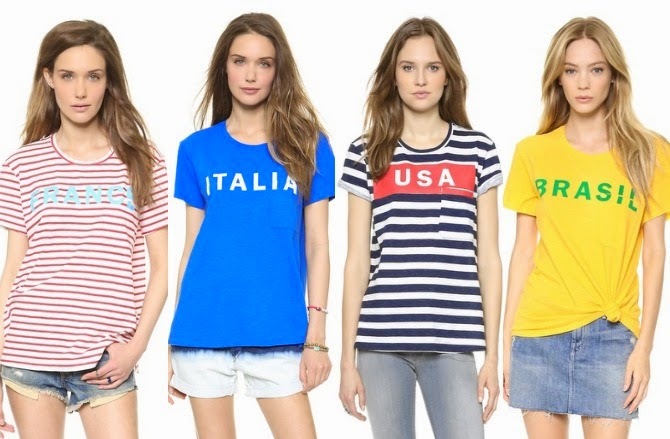 The brand created an exclusive collection of t-shirts and tanks for Shopbop, which make it hard to feel loyal to just one country. The best part is that these pocket tees are cute and slouchy enough to wear long after this month-long soccer-a-thon is over. Now somebody hand me my lipstick and a vuvuzela. Let's do this. All the reasons I love soccer lol! Cool post and I love these Tees!